'Black People Will Be Free': How Aretha Lived The Promise Of Detroit Black Power, black leadership and the black church all converged in the city of Aretha Franklin's youth. Once she had the means, she resolved to bring Detroit's potential with her. Aretha Franklin performs in Antibes, France in 1970. Aretha Franklin was so Detroit. Bring her pocketbook onstage at Washington, D.C.'s Kennedy Center and swing her fur coat behind her as she sits at the baby grand, Detroit. Pay Aretha in cash, Detroit. Stash that cash in her bra, Detroit. Unapologetic and black, Detroit. Lived in and represented Detroit till the day she died, Detroit. There is a recording of a 14-year-old Franklin singing Thomas A. Dorsey's "Take My Hand, Precious Lord." 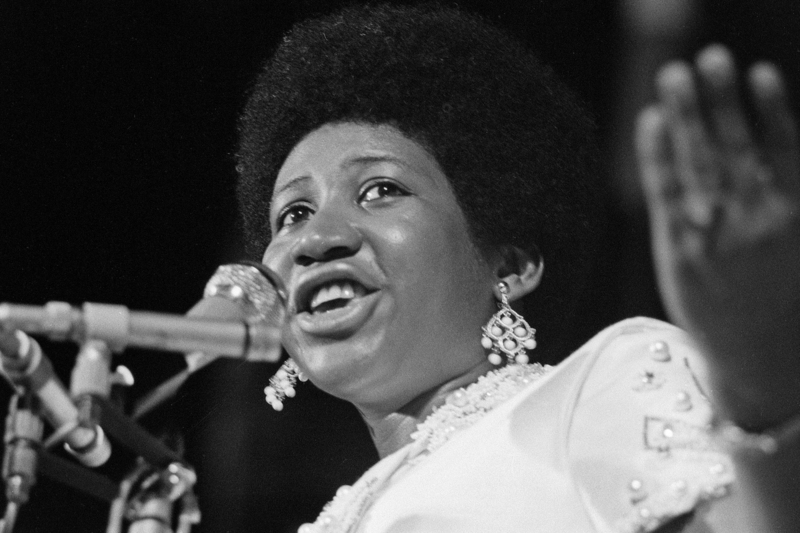 Even at that age, Franklin was confident enough to make that gospel classic her own, to moan whole lines, to give herself, as they say in the church, "up to the Lord." This performance is evidence of her preternatural, unmatched talent, but it is also used as evidence that Aretha, from the beginning, was "fully formed," a woman-child capable of channeling the great voices of women like family friend Clara Ward. Like the best church performances, this one is buoyed by the congregation, who affirms her with praise as she lifts to the heavens with her voice and soul their collective burdens, their hopes. We're at once listening to a 14-year-old girl who sounds, what we call, "grown" and listening to an audience engage this teenager with an enormous gift, a voice that promises a deliverance. What a gift; what a burden. From the beginning, Franklin's strength was measured, like so many women, by her ability to endure suffering. It's impossible to talk about Aretha without talking about her father, Reverend C.L. Franklin of Detroit's New Bethel Baptist Church. Born to Mississippi sharecroppers, Franklin began preaching and soul singing as a teenager. Just after World War II, he, like so many black Southerners who were fleeing racial terror and looking for work, found himself in Detroit. Mayor Coleman Young, Detroit's first black mayor, called him a "preacher's preacher." And when Franklin died from gunshot wounds after being robbed in his home in 1979, Mayor Young said his "leadership of the historic freedom march down Woodward Avenue in Detroit with Dr. Martin Luther King Jr. by his side in June of 1963 — and involving some 125,000 people — provided the prototype for Dr. King's successful march in Washington later that summer." It is important to understand the tradition of black liberation theology, a term coined by James H. Cone, that sought to use scripture to center black self-determination. In Detroit, pastors like C.L. Franklin and Albert Cleage of the Shrine of the Black Madonna used black liberation theology to help a growing black city to imagine itself powerful. They used their churches to launch the campaign of Detroit's black political class, including Coleman Young. At the same time, Rev. Franklin's church remained a touch point for even more radical organizing. He opened New Bethel to black auto workers who were waging a class struggle within a racist United Automobile Workers union. He gave shelter to Black Panthers who were targeted by J. Edgar Hoover's crusade against them. Later leaders of the fractured Black Power movement like the late Jackson, Miss. mayor (and Detroit native) Chokwe Lumumba gathered at New Bethel to form the Republic of New Afrika. There are two tweets being shared on black Twitter today that have me reflecting on the Black Power movement, and Detroit, and Aretha. One is an "On this day, August 16, 1970 ... " history reminder from the Smithsonian National Museum of African American History and Culture, which tells us today is the day a warrant was issued for Angela Davis 48 years ago. The other is a screenshot of a December 1972 article from the black weekly Jet magazine. The headline reads, "Aretha Says She'll Go Angela's Bond if Permitted." It has been shared thousands of times by people young enough to not know about the Black Power movement, only the civil rights movement — to not know about Aretha as a beacon of black and womanist pride and self-determination. In the article, Aretha is quoted about being at odds with her father with her support for Angela Davis. One can only imagine that he was afraid Aretha was wading in deep and troubled waters by publicly offering financial support to a self-identified communist and symbol of the radical Black Power movement, but Aretha doubles down: "Angela Davis must go free. Black people will be free. I've been locked up (for disturbing the peace in Detroit) and I know you got to disturb the peace when you can't get no peace. Jail is hell to be in. I'm going to see her free if there is any justice in our courts, not because I believe in communism, but because she's a black woman and she wants freedom for black people. I have the money; I got it from black people — they've made me financially able to have it — and I want to use it in ways that help our people." There will be many tributes to Aretha Franklin this day and this year. She lived an outsize, legendary life that can hardly be contained by words. But my God, she was Detroit, black Detroit. The Queen is dead; long live the Queen. dream hampton is currently producing a series of essays about Detroit through a grant from the Surdna Foundation.